EMERYVILLE, Calif.--(BUSINESS WIRE)--Women, on average, are paid 20 percent less than men. In recognition of Equal Pay Day, LUNA®, the first nutrition bar for women, is empowering everyone to show support for pay equality. LUNA is shining a spotlight on the gender pay gap in partnership with LeanIn.Org’s #20PercentCounts campaign by offering a 20 percent discount on all LUNA Bars sold on LUNAbar.com from April 3-11, 2017. LUNA will match the discount amount with a donation, up to $100,000, to fund salary negotiation workshops in partnership with AAUW. 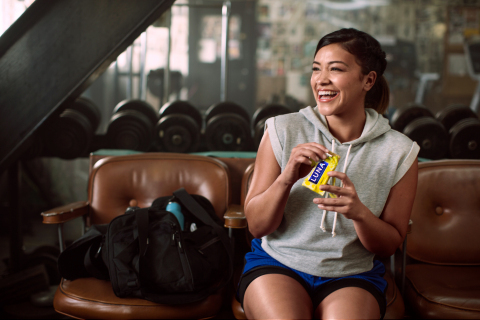 LUNA is also partnering with Gina Rodriguez, a staunch supporter of women’s equality. Playing off of Gina’s passion for boxing, the brand is debuting an equality video that follows Rodriguez for a day of training in the ring. Her strength, determination and resilience shine as an example to women everywhere to keep moving forward in the journey for equality and pay parity. LUNA has always believed in the power of women and a world where equal is equal. This Equal Pay Day, LUNA is proud to partner with LeanIn.Org to champion women and show why today and every day, women deserve their 20 percent. For 18 years, LUNA has championed women’s equality, supporting women in some areas where they have historically been underrepresented, including film, sport and business – creating platforms so their voices can be heard. The brand is behind breakthrough initiatives like LUNAFEST®, an annual film festival by, for and about women that raises the visibility of female filmmakers, as well as Team CLIF BAR (formerly Team LUNA Chix®), a pro-sports team created by LUNA to strive for equal pay in the sport of mountain biking. Most recently, LUNA provided financial backing to Sundance Institute’s 2017 Women at Sundance Fellows, awarding each fellow with a $10,000 grant, as well as funding two $15,000 women filmmaker awards at the 2017 SXSW Film Festival. LUNA is sponsoring AAUW Work Smart salary negotiation workshops for women across the country. By empowering women to negotiate their salary and benefits packages, LUNA and AAUW are working to close the pay gap one workshop at a time. For more information on LUNA and its boundary-breaking initiatives, visit LUNA online and to join us in the equal pay conversations, follow along on Facebook, Instagram and Twitter with #20PercentCounts. In 1999, LUNA created the first nutrition bar for women. LUNA has been championing women with programs and initiatives that empower and inspire in areas where they have historically been underrepresented. LUNA Bars are non-GMO and are a delicious way for women to get the nutrition they need and the taste they want so they never have to settle. LUNA Bars are available in 21 different flavors across LUNA® Protein, LUNA® 5g and LUNA Bar. The bars can be found at a variety of natural, specialty, and traditional grocers, as well as online at LUNAbar.com. Follow LUNA on Facebook, Instagram and Twitter. LeanIn.Org is an initiative of the Sheryl Sandberg & Dave Goldberg Family Foundation to empower women to achieve their ambitions. LeanIn.Org offers inspiration and support through an online community, free education materials, and Lean In Circles, small peer groups that meet regularly to learn and grow together. The Lean In community includes more than 1.5 million women and men and 32,000 Lean In Circles in more than 150 countries. The Sheryl Sandberg and Dave Goldberg Family Foundation is a private operating non-profit organization under IRS section 501(c)(3). The American Association of University Women (AAUW) empowers women and girls through advocacy, education, philanthropy, and research. Our nonpartisan, nonprofit organization has more than 170,000 members and supporters across the United States, as well as 1,000 local branches and more than 800 college and university partners. Since AAUW’s founding in 1881, our members have examined and taken positions on the fundamental issues of the day — educational, social, economic, and political. Through AAUW Start Smart and AAUW Work Smart, AAUW is closing the gender pay gap one workshop at a time. Learn more and join us at www.aauw.org.